Can we stop our cat hunting? Want to stop your cat hunting wildlife? Follow these tips from behaviourist Francesca Riccomini. (Q) Our family hated it when our last cat brought home dead animals, especially birds. He had a collar with a bell on it, but it didn't make any difference. We're about to get a new cat and would like to take steps to prevent him from hunting. Can cats be trained not to hunt? If so, could you give me some information on how to train him? Behaviourist Francesca Riccomini answers: Many cat lovers find it hard to reconcile the image of their pet cat as a loving companion with the coldblooded feline hunter. However, we have to accept that hunting is a fundamental feline behaviour. 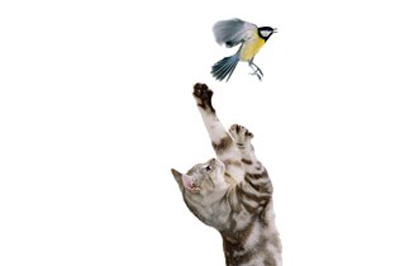 Cats hunt whenever their brain is stimulated by appropriate sounds or images, be it toys, insects or larger prey. Training cats not to hunt is impossible, but you can make a difference by restricting their access to potential prey or channelling their hunting behaviour into more acceptable activities. There are many devices on the market designed to make hunting unpleasant for the cat or to startle the prey. However the most successful way to control hunting is to ensure that your cat can engage in predatory behaviour either in play or while obtaining his food. This can be achieved by providing daily games with fi shing rod-style toys and by hiding food around the house so that your cat has to seek it out. It can also help to feed some of the daily food ration in puzzle/ scatter feeders so that your cat has to spend more time gaining access to it. These feeders can be made from small plastic drink bottles, which are filled with dry cat food biscuits or treats and have holes made in the side through which they fall out when the cat rolls or knocks the feeder, or you can buy commercial scatter feeding toys from pet shops.